Double sided cushion with piped edging. Concealed zip. NEW OUT July 2018 Host Your Own Race Night. Complete Version. At Home or for fundraising. Races taken from Race Night 1 and 2. Study the form, Check the odds then place your bets! Watch the Race. Check the results and hopefully collect your winnings! Contents include 2xDVDs with 32 thrilling races, £50,000 'in cash' (not real!). Betting Cards, Bookmakers Ledger, Score Pen, Race Form, Guide and Rules. Great Value! Suitable for those over 14 years of age. 2 players plus. Commentaries by ITV's Classy Racing Commentator Mark Johnson. Europe Region 2 Exempt from classification. Racehorses & Jockeys featured - Red Rum (Brian Fletcher), Best Mate (Jim Culloty), Shergar (Walter Swinburn), Nijinsky (Lester Piggott), Yeats (Johnny Murtagh), Kauto Star (Ruby Walsh). Currently - Out of Stock. Zip fastening. Interior features zip and slip pockets. Buckled adjustable shoulder strap. Tapestry type material. Faux leather drawstring fastenings plus magnetic fastener. One hand held strap plus 2 adjustable back shoulder straps. Interior features zip and slip pockets. Reinforced base with faux leather trim. Tapestry type material. Exterior zipper fastener with internal zip pocket. 2 faux leather handles and reinforced base. Tapestry type material. Features inner zipper closure on top and inner zip pocket. Reinforced base. Full width zip fastening and added velcro fasteners. Zip pocket on interior with mesh pocket on exterior. 2 full width exterior pockets. Canvas handles. Tapestry type material. Features a slip pocket, mobile phone slot and zip pocket. Fully lined. Sturdy faux leather handles and base with stud feet. Features 1 zip pocket and 2 slot pockets. Two buckle fasteners and adjustable webbing strap. Features 1 zip pocket and 1 slip. Robust faux leather handles with 2 side straps. Suitable for iPAD or Notepad. 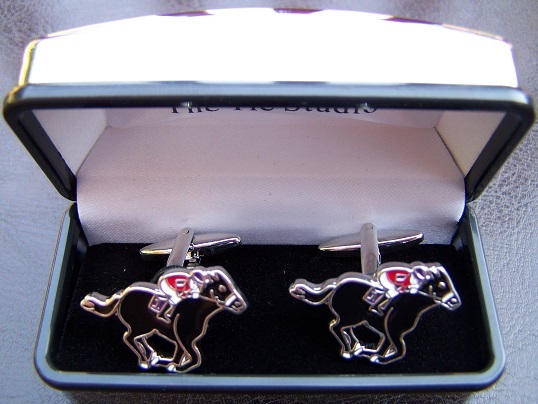 horse racing jewelry and horse racing prints since 1991. The one stop horse racing shop for horse racing bronzes, horse racing cards, horse racing gifts, horse racing jewellery and horse racing prints.